Fine punch Fab Pvt. Ltd’ was incepted in the year 2006, it is located in Electronic city – Bangalore-Karnataka(India). Fine punch Fab Pvt. Ltd’ is an ISO 9001-2015 certified company, having more than decades of extensive experience in the line of sheet metal fabrication and metal cutting. 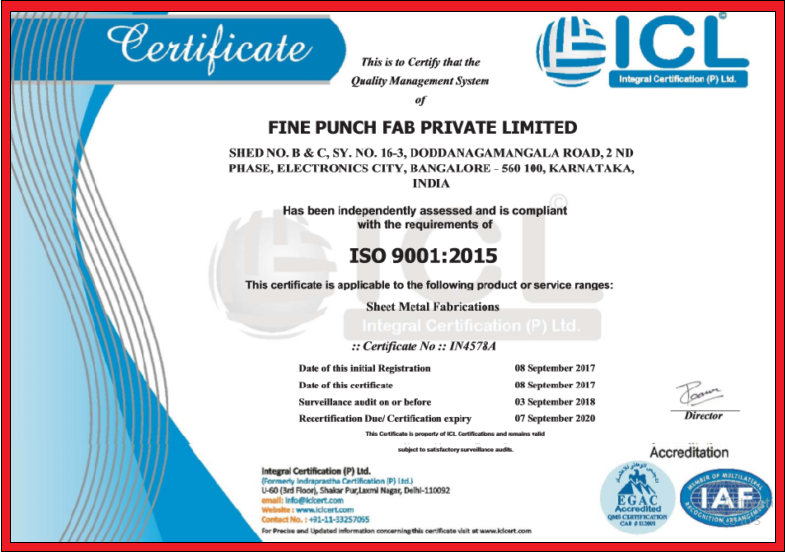 Fine punch industry known for manufacturing, and supplying a comprehensive range of optimum quality sheet metal products in MS/SS/Aluminum & copper. We specialize in precision sheet metal fabrications and cater the needs to electronics and electro-mechanical, engineering and automobile sectors. We have equipped with ultra modern manufacturing facilities comprising of CNC turret punch, CNC laser cutting, CNC press brake, bending, CNC shearing m/c, acrylic laser cutting m/c, iron worker, pressing, punching, welding(TIG, MIG, spot welding m/c) facility. Our team consists of highly qualified technicians and workforce are deployed to handle these machines to get best throughputs. Every item is manufactured by using these machinery and the finest raw material, under the supervision of highly experienced technocrats. We offer custom-built components, made-up to your design specifications. We supply products like CNC Punched precision sheet metal components, Tele communications products, control panels & enclosures, ups & stabilizer cabinets, modular work stations for office interiors, canopies & fabrication assemblies and more. Also we provide the job works metal fabrication, CNC punching, bending, laser cutting, welding jobs. The availability of all these facilities under one roof and skilled work force of professionals. We have an outstanding reputation for the quality of our products and the high level of service that we provide to all of our customers. Fine Punch Fab Pvt Limited strives to be the client’s choice for engineering services based upon our ongoing record of meeting or exceeding their expectations. Providing long-term commitment and support to our clients. Remaining at the cutting edge of manufacturing(sheet metal fabrication and metal cutting ) services and combining this knowledge with the highest standards of engineering practice. QUALITY – we are committed to providing the highest quality service and products to our clients and to add value to their investment. Our end to end engineering processes and systems provide the means by which we can deliver our service and commitments. VALUE – we treat our clients business as our business by providing value for money and obtaining the most competitive pricing. INTEGRITY – we will be honest and open in all our dealings to ensure we obtain the trust of our clients. TEAMWORK – we actively promote teamwork and expect each person to take responsibility for their work, and treat others with respect. INNOVATION – we aspire to provide our clients with innovative and effective solutions in our production and provision of service.